A gas self-cleaning oven is different from a regular gas oven because it has a separate self-cleaning cycle. The cycle uses extremely high temperatures to incinerate grease, spills and any leftover food particles. The oven uses a single burner to achieve these high temperatures. Using the cycle does not automatically eliminate the need to clean the oven. However, the self-cleaning feature does greatly to reduce the time and energy it takes to clean the oven. Remove any oven racks, grills, inserts and pans from the gas oven. Clean them with a scouring brush and dish washing liquid. These oven accessories cannot withstand the temperature of the self-cleaning cycle. Clean any large spills with a washcloth and warm, soapy water. Dampen the washcloth with the soapy water and wipe up the spills, being careful not to ignite the single burner. This is necessary because if the oven is very dirty, it will produce heavy smoke or possibly catch fire as it burns off the spills. Close the door and press the "Clean" button. The door will lock automatically. Press the up or down keys on the "Set" button, or turn the "Clean" dial accordingly to adjust the cleaning time. The dirtier your oven is, the longer you must set the cleaning time. Most gas self-cleaning ovens have a maximum cleaning time of four hours. Open the door after the unlock sign appears. The unlock sign will turn on approximately one hour after the self-cleaning cycle has completed. Leave the door open for another 15 minutes to completely dissipate the heat. Clean the ash that is left behind after the cleaning process. Use a damp cloth to wipe up the ash from the sides and the bottom of the oven. Replace the oven accessories and close the door. Turn on the kitchen fan and open the windows and doors in your kitchen to help with ventilation. 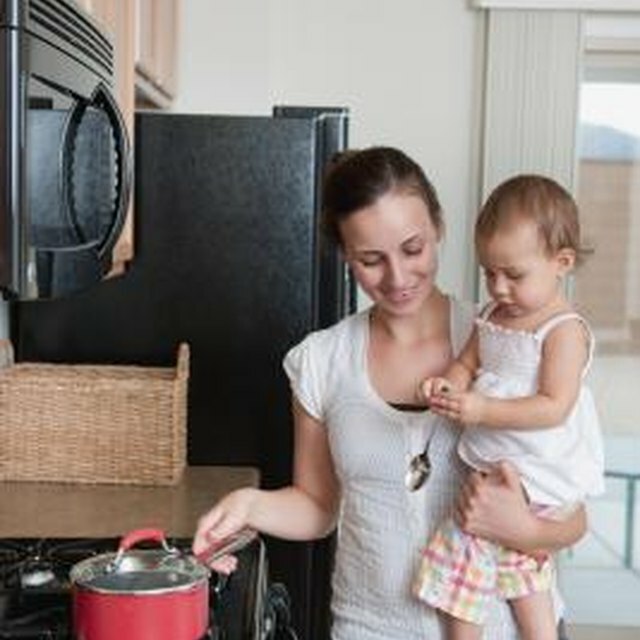 Do not allow pets and small children near the oven during the self-cleaning cycle, because the outside of the oven gets very hot. Never use oven cleaners in a gas self-cleaning oven, as the residue may ruin the oven's finish.